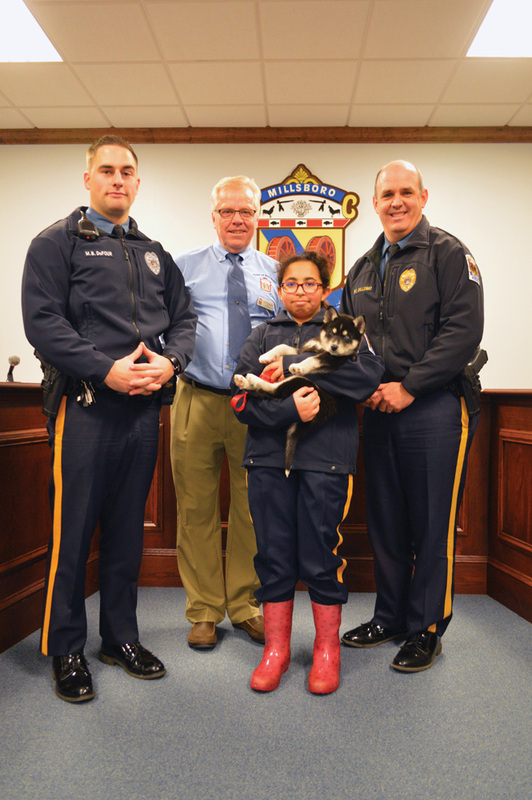 Seventh-grader Aria Hill and ‘chusky’ Tofu reported for duty on a ride-along with the Millsboro Police Department. Cpl. Matthew Dufour planned to do some basic training and let her observe several (safe) complaints. Based in Seaford, Hill’s family won the ride-along as a prize at a school fundraiser at Lighthouse Christian School in Dagsboro. Although ride-alongs are common, this was the MPD’s first time allowing it as a fundraiser prize. After donning an official police shirt, Hill was sworn in by the mayor and police chief. Although her mother also tagged along for liability reasons, the “chusky” (chow-husky) puppy was a surprise participant. Hill’s one-day commission ended with lunch at Chick-Fil-A.